Our torque tools use intelligent design for accuracy without the need for expensive calibration. An industrial-grade internal spring manufactured within extremely tight tolerances pre-determines torque setting. The tool does not need to be set into calibration and cannot shift out of calibration. Ergonomic handle fits your palm with a four-finger grip to make wrenching easier. Tool provides an unmistakable 20 degree overrun when the torque limit is reached. Users can be confident knowing they have the correct tension. Low profile allows the tool to fit into more places for use, overall 60% lower height than tools costing twice as much. Prestacycle’s TorqKey is fast and easy-to-use as an everyday tool. Color-coded tension markings on both sides make it a quick-grab on your workbench. 50% thicker walls in the bit shaft make our tools stronger and more reliable than others. They provide Torque relief in the right (clockwise) screw tightening direction, and hold firm in the left (counterclockwise) unscrew direction. You can unscrew fittings that were just tightened with the TorqKey. This is very handy when making multiple attempts to get a cable adjustment just right. NOTE: Do not use TorqKey to remove stuck, damaged, rusted or over-tightened fittings. Prestacycle TorqKeys are available in 4Nm, 5Nm, 6Nm, 7Nm, 8Nm, 10Nm and 12Nm. Combine TorqKeys with our Ratchets and Bit sets to make a more complete tool set for Bicycle servicing. Standard Magnetic Hex Tip works with our 20 Piece Bicycle Bits set, our long Bicycle bits and any other 1/4″ Hex bits. Prestacycle TorqKeys are different… designed from the start with real-world experience on Bicycles. Mike Magnan of Mesa, Az. waves to other bikers as he rolls into the South Side to complete the Greenway Sojourn bike trek on Saturday, June 30, 2007. 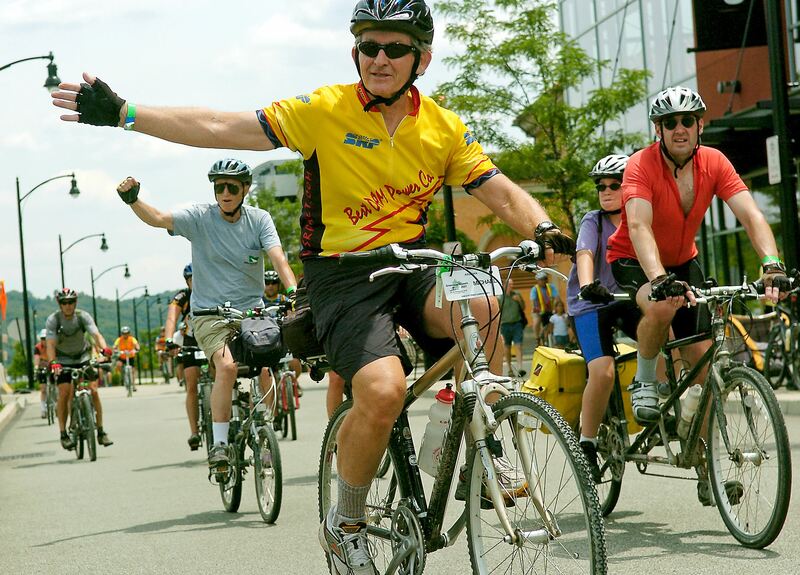 Around 500 cyclists spent eight days riding the 335 miles from Washington, DC to Pittsburgh along the nearly completed Great Allegheny Passage. Cities and states have long urged their residents to ride bicycles, as a healthy form of recreation and as a green alternative to driving. Now they’re recognizing pedal power’s economic potential. Tourism officials and cycling advocates sometimes refer to tourists on bicycles as “wallets on wheels.” That’s because they stay longer in a state and spend more per day than other tourists. Oregon, for example, has found that bicycle tourism contributes $400 million a year to its economy — roughly $1.1 million a day. It was the first state to create a Bike Friendly Business Program that helps businesses market to bicycle tourists.